The old domain of www.lordofthecrinkles.blogspot.com is now dying on the vine but will still work for some time to come, so Google say. Ok, three months have passed since my canoe trek in Sweden in May. As with many things, business comes first and we have been exceptionally busy since we returned, despite the recession. I'll be breaking this trip report down into bite-size chunks in order to get something on the blog. So much happened, a good distance was paddled over the eleven days, about 120 miles the weather was pretty good for the time of year (we had no blizzards this time!) and the food and whiskey was better than ever! It was a good trip, full of interest with abundant wildlife, great landscapes, rivers and lakes.... and a little drama during a sudden violent storm to leave us with great memories and wanting more. Since I started this blog, I have come into virtual and actual contact with many people and new opportunities have presented themselves to me in ways which I would never have previously considered. One thing we all share is an appreciation of the outdoors. We all have our reasons and philosophies behind this appreciation and I enjoy reading the multitude of thoughts, opinions, gear reviews, routes, images and useful information that blogging throws into the virtual outdoors world. One major discovery I have made is the power that a regularly updated blog can hold within the murky world of search engine activity and the immeasurable potential for driving internet traffic to a website. Late coming, I know, there can be no excuses for the neglect. It may not hold much interest for many who read and follow Hard Light, but it all happens outdoors, given the chance! BBC Radio 2 have a programme scheduled on Saturday 15th August to commemorate the 40th anniversary of the Woodstock music festival. The presenter is John Sebastian (those of a certain age will remember the Lovin' Spoonful!). Business took us to North Wales last week. Just a stone's throw from Snowdonia and the Ogwen Valley, the temptation to stay over was simply too great. 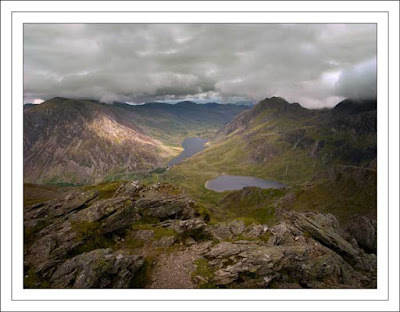 We decided to pitch the heavyweight camping gear under the watchful gaze of Tryfan for a couple of nights. What a beautiful evening. Warm, sunny and most un-Ogwen like. The Milestone Buttress layby is always busy at weekends, but once everyone has gone (and they always do!) and the A5 quietens down, it's a great place to sit on the wall with a glass of wine and soak up the surroundings on a fine evening. I had high hopes of the same again for the following day. I should have known better, this is Snowdonia! Late nights and long days. I finally got around to tidying twoof the reallyimportant websites I own. Well, they do put bread on the table! Too many images on both, so I've trimmed them down a bit and re-arranged the text to make things a little faster and more legible. With anything important and technology driven, it's seems to be a long-winded and occasionally frustrating process to get things looking something like the way you want them to on a website. The shot of Norfolk Island on Ullswater above is a good example. The template will only show a very low resolution version of it for some reason. Infuriating! For the technically minded, it was taken on RVP 50 with the Hassleblad 503CW and 80mm Planar at f8. Not sure of the shutter speed, but I guess around 1/8 sec. Frankly, I'd rather be taking photographs!